Located one block back from the Coomera River with amazing water views this contemporary home offers a lifestyle that very few homes on the Gold Coast can provide. This is a lifestyle acreage property in a thriving urban suburb with immaculate gardens on a one acre allotment with river views! Architecturally built to cater for a large family, this property offers everything from a designer reception hall upon entry, soaring high ceilings, polished hardwood timber floors and modern décor features to make the most out of family living. • Three abundant living areas, two of which surround the central kitchen and both areas have their own spacious timber decks each with roll down blinds to enclose the spaces for added living or conversion to an outdoor sunroom. • One deck and living area has sliding bi-fold doors and beautiful easterly views over the scenic lake while the other looks west over your tropical 4000sqm block with bushland surrounds. • The third living area is a large enclosed media room which can cater to the diverse needs of a family. Use this space as a 5th bedroom, run a home business or set up as the children’s playroom … the options are endless. • The galley kitchen is functional in its design and appealing with fresh modern décor selections such as an essential large island bench with breakfast bar and stone benchtops, gas appliances, large fridge space and of course cabinetry to cater to a growing tribe. • Down the hallway you will find two vast children’s bedrooms, a third bedroom ideal for a home office or nursery and a large master suite that hosts a beautiful ensuite walk-in wardrobe and of course large windows and doors to take in the surrounding gardens and access to the deck which overlook the pool area - absolutely perfect! Spotted gum polished timber floors, high ceilings, gas hot water system and gas cooking, reverse cycle ducted air conditioning, plumbed fridge space, large separate laundry with private deck and easy access to clothes line, abundant storage throughout, Colorbond roof, 3x3 metre garden shed, 6x3.5 m carport, rainwater tank and so much more. • The basement level will find you in the party area of the home. What family home would be complete without a designated rumpus area for the teenagers to kick back or enjoy those footy nights with some mates! • This room provides occupants with the perfect pool room set up, man cave, tools area and huge undercover entertainment area. • The large outdoor (under home) space will give you all the room you need when entertaining and is the third outdoor area on the residence. Equipped with a small outdoor toilet, open aired bushman’s powder room, polished timber bar set up and tropical outdoor shower, this area interconnects with the huge swimming pool zone. • The modern 70,000 litre swimming pool is perfectly positioned for privacy and to be enjoyed from each area of the home. Low maintenance landscaping surrounds this space and offers young children the ideal place to have fun in the sun! • The home also hosts a double lock up garage and large high roofed carport to give side access for your caravan, boat or campervan. • With a picturesque meandering creek bed and walking tracks that open onto the beautiful Coomera River, this property is only a stone’s throw from action-packed parks and community fishing clubs that encourage a life be in it attitude on the activity packed Coomera Lake. It is rare to find such a large parcel of manicured land in town and walking distance to local schools, shopping districts, transport, parks, and inner city facilities. You get to enjoy all the space, tranquillity and privacy that an acreage home can offer without having to drive miles each day. Somewhere your children can still be close to school friends yet so much room for you to explore and enjoy! 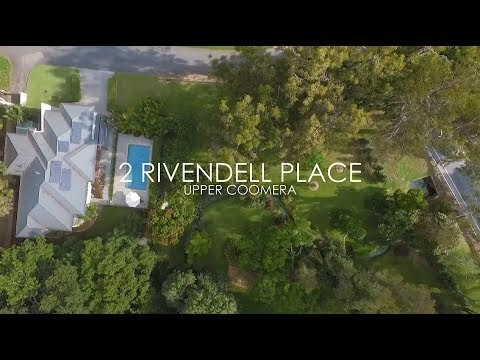 Life at Rivendell would be easy for a large family as the modern residence has been perfectly designed for each family member and a property like this is an opportunity not to be missed!